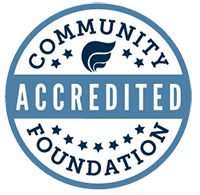 The mission of the Community Foundation is to enable donors to give back to our community by establishing various types of charitable funds. We offer these services through a very small but efficient staff and a business plan that maximizes efficiencies while reducing costs. You are creating community impact when you support the work of CFMC. Behind every grant, fund, workshop, donor, event … YOU. You make our work possible and touch every thing we do to enhance and enrich the quality of life in Middlesex County – for everyone. Your support of the Community Foundation Fund a strong Foundation which supports and enhances the work of hundreds of donors and nonprofit organizations. It takes leadership, compassion, and a dedicated staff to “Help Good People Do Great Things.” Your gift to the Community Foundation Fund helps sustain the Community Foundation’s continuing work of promoting philanthropy in Middlesex County.